Anyone who’s read my eclectic blog knows my love and reverence for Leo Fender and his creations. Here’s the story of a gentleman who shares that and uses it to make the world a better place. Back in the 1960s and ‘70s, there were few who had much interest in older instruments. You could buy ‘em cheap, because they were just old guitars. Here’s a photo of our old Boy Howdy Band, taken in Naples, Florida, in June, 1972. From left to right are my still-best friend, John Klingler, drummer Mike Collins, and me on bass. My bass back then was a used Gibson EB-3. The guitar John’s holding is a 1952 Fender Telecaster. Old Teles and their predecessors — made by Leo Fender’s small company from 1950 to 1954 — are now reverently called “Blackguards,” because of the single-ply black pickguards Leo fitted them with. These early Fender guitars — the Esquire, Broadcaster, one with no model name now called a “NoCaster,” and the Telecaster — all looked much alike, sharing the neck headstock, body shape, pickguards, and control layout. Today, John’s Telecaster, if in nice condition, would be worth $50,000 or more. John bought it in Tampa for $250 in 1972 and proceeded to sand it to bare wood, stain it, route a hole for an old humbucking pickup in the neck position, and fit it with a pickguard he made. I watched him do it and neither of us gave it much thought. John was handy and was just customizing an old guitar. After playing the modified Tele for a few months, John sold it to someone for $250 and bought a beautiful Gibson Firebird. But this little anecdote just proves that old Telecasters were not, at that time, recognized as being particularly valuable . . . except by a few unusually perceptive people. Let’s meet someone who was not only perceptive, but went on to “write the book” on old Teles and related Fender guitars. He’s regarded as the world’s foremost expert on Leo Fender’s guitars, and, happily, is generous enough to share that info with anyone. 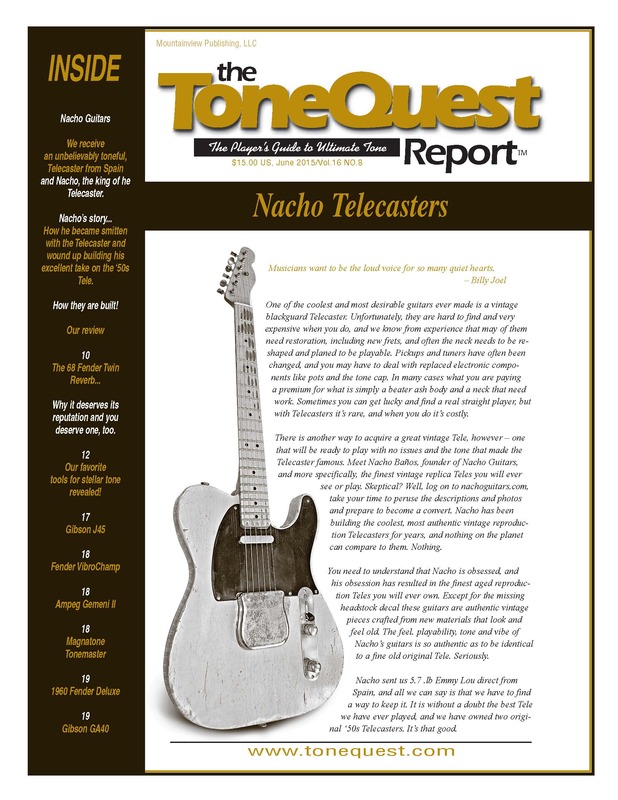 Eventually, Nacho decided to write a book, and THE BLACKGUARD — Telecaster Style Guitars from 1950- 1954, was published in 2004 or so and is considered the bible of Telecaster lore. At over 400 pages, the 12” x 12” book, with its slipcover, weighs over 10 pounds and has over 2,000 highly detailed color photos of 50 early Esquires, Broadcasters, NoCasters and Telecasters. The amount of info in this volume is stunning. Nacho self-published 5,500 of these books, and, knowing print production like I do, I suspect that he sold them at about half of what they cost him to print. Proceeds from the book went — I told you Nacho was an absolute gentleman — to establish a foundation building homes and a school for the poor in India and providing clean water in Africa. With the help of some famed guitar-slingers and old-world craftsmen, Nacho has somehow arranged to make a few reproductions of some early Telecaster and Stratocaster guitars. They are jawdroppingly accurate, and — best of all — they are sold at about a tenth of what a vintage guitar costs. As lovers of fine old paintings revere every crack in the varnish on an old masterpiece, so do those of us who love the old Fenders. Two gents who know their Teles! Nacho and Billy Gibbons of ZZ Top. Using the best components money can buy, and guided by years of examining — and owning and playing — hundreds of the old Fenders, Nacho has nailed the look, feel, and tone of these old classics. Uncanny. He also recreates Statocasters from the days of Buddy Holly. Labors of love from a man whose love for Leo Fender’s creations have shaped his life and brought joy to so many other guitar lovers. And, along the way, homes for families, and a school for their kids, and clean water for whose who wouldn’t otherwise have it.